In 1999, they made a movie of my favorite video game. Like much of the fandom at the time, I was a senior in high school and it was that point in our lives when the world seemed most huge and infinite, the future seemed wonderful and terrifying and we all seemed like we could do no wrong. We had begged and pleaded with the God of intellectual property management for years for just this moment and its timing seemed almost divine: our favorite series elevated to the next level of respectability just as we too prepared to take off to start running the world. But this isn't a great success story about the best movie. I can't tell you that Wing Commander is a great movie. I can't even tell you it's a very good movie. What I can tell you is that Wing Commander is my favorite movie. Growing old is straight out of a Twilight Zone script. You want badly to impart your hard-fought wisdom to the next generation. You want to save them from the pains and the troubles and the fears and the wasted efforts you went through. You want to tell them to forget battling one another and to focus on loving themselves because you wasted so much time on hating, most of all yourself. You want to tell them how much potential energy they have inside themselves because you had that same energy and you squandered it the same way they now will. You want to tell them that it's okay to be scared and that there are so many possibilities they can't understand right now because you remember what it was like to be so frightened and confused by the world. But of course you can't. It's one-way glass. The next generation can no sooner bow to your wisdom than you could that of your father. The internet was new then and it wasn't quite so horrible. When they first hinted that a Wing Commander movie was on the way, my friends and I leaped into action in only the way a bunch of teenagers given full access to and no understanding of the terrible behemoth that was lurching on its hind legs preparing to radically change society. But to us, then, the internet was not a vehicle for destroying the world or a starry hope for saving it... it was a simple new tool that did the most amazing thing we could imagine at the time: it put us in touch with friends around the world who had the exact same excitement about a Wing Commander movie. We had the time of our lives tracking and recording and hunting for information about the production. It seems so silly in retrospect, but it felt so very adult to be translating newspaper stories from Luxembourg and having top secret instant message conversations with extras eager to talk about what they'd seen on set that day. In the years that followed, the Wing Commander movie became this common glue that kept us together. The series never came back, we never had another big cinematic Wing Commander game… but we all made the choice to stay Wing Commander fans and to keep that connection an important part of our lives. For a time, in our twenties, we used to battle about it: we cool kids who liked the movie and got something out of it versus the world. That's how it is when you're in your twenties you know: you and yours versus the world. It's a stupid way to live and it hurts everyone and you wish you could go back and change it the minute you grow past that way of thinking. But you can't! We matured and we learned to treat one another well and to focus our efforts on thought and creativity. And we grew up, more or less! Can you believe the nerdy kids in ill-fitting suits at the Paramount Theater on Congress on March 11, 1999 would be in each others weddings a decade and some change later. Who would have thought a couple of beautiful ladies would ever find us? As I say, I wouldn't have believed it if you'd told me, Through it all, Wing Commander was still our centerpiece, the thing we kept thinking about and talking about and enjoying just to have something familiar to enjoy. And most beautifully we learned to start asking questions instead of saying so to everyone. We applied that to our favorite movie: why did Chris Roberts make this choice? Where did this prop or this idea or this change from that script come from? How did they make this shot work? There's so much that comes from making sure you keep thinking. So I'll say that I think you can write a very smart gotcha essay about how good a movie Wing Commander really was. That the beautiful set design and cinematography and wonderful cast of European character artists make it something really special. You could point out that the CGI and the adult themes hold up in exactly the way those same choices on the following month's The Phantom Menace, the 800-pound gorilla that forced it out the door unprepared, don't. But that's not my point. Wing Commander is mine and I'm happy with it for its warts. Looking back I think more than anything that it may have been the perfect film for lost, nerdy teenagers in 1999. It was so like us: full of infinite potential and many beautiful pieces that didn't quite know how to fit together. It spent so much time in its own head but ultimately suffered so much for trying to fit into a world that didn't care about that effort. They should've made more Wing Commanders the same way they should've made more Ben Lesnicks and more Chris Reids. Ah well, water under the bridge! I still watch the Wing Commander movie today a couple times a year. I know there are better movies and newer movies and bigger movies and movies with so much more thought behind them. I don't care, Wing Commander is my lodestar. It's something that keeps me thinking in different ways and that connects me with the world. I'm absolutely fascinated by it. I understand today why no one else is but I hope they at the same time understand it's not some pretense on my part. I love the film for what it is and I do not care for what it isn't or what people once told me it should've been. I love what it adds to the Wing Commander universe and I love just the challenge and the thought that goes into finding new ways to think about it. I am never so happy after a long day of work to find that AD or LeHah or any of the other WingNuts who still populate a Discord together have made some minor discovery in the background of a scene or dug up some new nugget of information about how the movie was made. It's something that simultaneously takes us back and moves us forward and in a world of uncertainty and fear that's something I'll elect to keep holding onto. At twenty years out I will again tell you that I can't speak through the glass. I can't tell you to be good to one another and to build and love and share and to put people and happiness over things and ideologies and all the other advice I had to learn instead of be given. And this isn't a rental recommendation, I won't tell you you need the Wing Commander movie in your life. It's mine and not yours and I've well learned the dangers of imposing my views on others. But if I could transmit one small wish across time and space and culture and void to all of you then it would be my sincere hope that in twenty years you're able to look back and realize that you have a favorite movie, too. 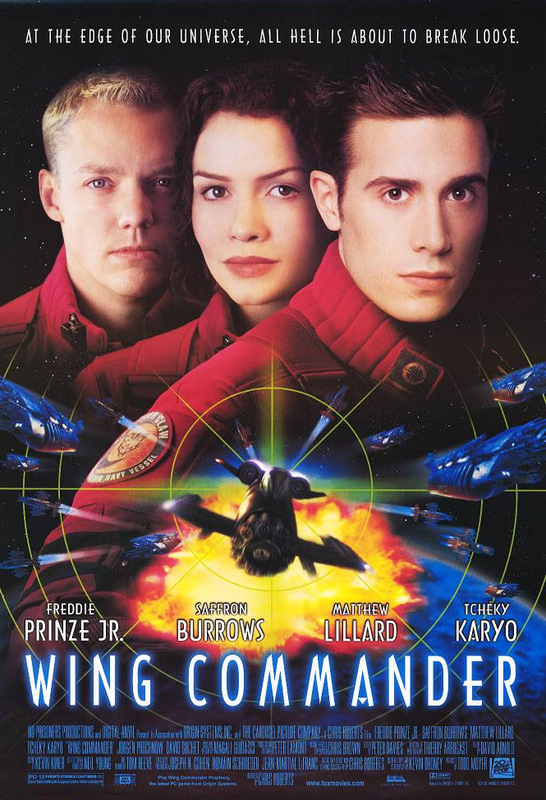 For quite a long time, the Wing Commander movie played a sort of ritual role for me - whenever I bought a new computer, changed the DVD drive, or whatever, the WC movie DVD would be the first thing I'd watch (way back in 2000, it was also the first DVD I ever bought). These days I've kind of forgotten about it, in much the same way that I haven't really played any WC game for about half a decade. I hope to finally get around to watching the HD version at some point soon, which I'm sure will be an interesting experience - both because it's HD, and because it's been so long. All that being said, I've definitely never actually liked the movie as such - I certainly don't have the emotional attachment you have to it, and it's easy to see why, given that at the time, not only did I barely have the time and internet connectivity to keep up with the news (let alone contribute to the community), and indeed I didn't even have an opportunity to see the film in cinemas. That last bit is in itself a funny story, which I think I've mentioned a few times, but which bears repeating - I showed up to the cinema, and they didn't let me buy a ticket, because nobody else did, so they weren't going to bother screening it. Today, in the age of the multiplex cinema where nobody blinks twice about screening a film even when literally no one shows up, that seems unthinkable. So, I never really had the opportunity to be excited about the film - I'm kind of envious you did, actually. For me, the core of my WC movie experience were actually the discussions around the film. It came out in March 1999, I didn't see it until some time in mid-2000. In the meantime, it was also around March 1999, coincidentally, that I joined the then-brand new, and intensely active CIC CZ, and read all those discussions in which the "I hate the movie" side was without a doubt the louder one, Subjectively, it also struck me as the more convincing one, though evidently I was still interested enough as a WC fan that it did end up being the first DVD I bought (a day or two before I bought my first DVD drive). Still, sitting down to watch the movie, my perspective was "I hope it's not as bad as all that." I was actually more than pleasantly surprised, because the movie proved to be entirely watchable. Possibly - ironically? - I was also somewhat inoculated to all the most popular criticisms, because hey, if you hear all the arguments about gravity on the runway fifty million times over, by the time you see that scene, you just shrug it off. Regardless, the end result is that the movie has meaning to me not because I particularly like it, but only in the sense of being an important part of the WC franchise (I still dare not use the word "canon" - I certainly consider it as such, but the memory of all those discussions... ). I sure did love playing with the movie in Standoff, though. Episode 5's intro, with the movie clip transitioning into our own story remains among my favouritest Standoff scenes, not in the sense of how it turned out, but because it was such a wonderful "aha!" moment when we first came up with the idea. Earlier this month, someone put up an experimental art exhibit where I work about nostalgia for the early 2000s. It was a looping video of strangers and teenagers on a roadtrip to somewhere unknown, wistful guitar pedals hummed over the speakers, a couple of cheap lightshows spun in the room with the lights turned off. Across one wall was a long, continuous stretch of paper inviting people to draw or write their personal memories anonymously; to let the room's vibe feed into a person's own wellspring of memory. In a small corner, I wrote "We were right when we were sixteen, and nothing here matters anymore." That, of course, is painting with a broad brush because a lot of things today matter that didn't exist when I was sixteen (Bills! Car payments! Rent! Work!) but the formative years are what prepare you for the very long stretch that brings you to today. "If you've made it this far, you're already a survivor" and so on. Wing Commander was - no, *is* - as important to me as any other media I took in growing up. Star Trek, Star Wars, Stargate, you name it - but unlike those, Wing Commander was always distinctly personal to me. Part of it is the friendships and the real world world-building that comes from knowing some of the CIC people for 20 years(?!). The other part is the familiarity that comes with time spent with anything: in my mind's eye, I can literally walk every corner of the TCS Victory and know every deckplate and bulkhead and console. The film was the apex of all that in my imagination. Putting aside the fact that the film is troubled (which is not to damn it, but to raise it up), the fact that our fandom and franchise was so powerful it got - no, *demanded* - a film, spoke to me on a very personal level. Even more so as an 18 year old, about to graduate high school, waiting for the movie to start in the theater with my copy of Fleet Action in hand. It was as if the world its self was validating you, personally, somehow. Magical thinking, surely, but also magical. Its now been two decades since that first viewing. I wrote Chris Roberts to thank him in 1999 and he was kind enough to reply by filling my mailbox with all sorts of stuff - I'll be wearing my CSS Tiger Claw hat tonight as we stream the movie for discord and YouTube. We have become custodian to a small corner of time by allowing ourselves to own a little movie that came out and, warts and all, wouldn't trade it for a damn thing in the world. Wouldn't trade anything for the CZ or the people I know or the incommunicable experiences we shared. Most of us here are old hands. If you're new, welcome! Get ready to hear people discussing the absolute joy of discovering the Rapier-B! And Pilgrims! And a whole host of world building the likes of which very, very few franchises ever get. And for what its worth, some old ghosts of a time past that meant more to us than anything else has since. But like the old wizened saying goes, "You had to be there". And there is truth in that - more than I could ever communicate. And some place in 1999, I exist in a small corner of a movie theater. And with my presence I wrote "We were right when we were sixteen, and nothing here matters anymore." I kind of love that I don't like the Wing Commander movie. 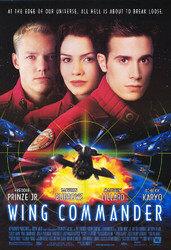 I'll defend a lot of bad TV because it falls under the umbrella of a franchises I'm fond of, but not Wing Commander, I just genuinely adored it, all of it, from the games to the TV show to the books, I don't know how to make excuses for it, and my lack of fondness for the movie reminds me that until 1999 that I'd never had to. I think WC is an average game movie - which is pretty bad. I only have VHS (picked from a flea market years ago). I don't feel that strongly about it, kinda meh. Perspective is an enduring trait of the human condition; the ability to look back through a different lens but still retain the ability to put yourself back in that situation, years later. Even though I have MORE than made my peace with the film, I can still dredge up the feelings of disappointment I felt on my first viewing. Yet here we are 20 years later, and in spite of those emotions I felt back then, I can still watch the film & enjoy it. Looking forward to another 20 years of experience - who knows how we will interpret things in that time! Hmm. I was about to write that our perspectives are not likely to change that much with another twenty years, since the big jump is from thinking like a teenager to thinking like an adult. But then I realised that in twenty years, many of us will not only have fully grown children, but indeed will be grandparents. So yeah, perspective will keep shifting. Meanwhile, a funny thought - we're constantly talking about how much faster the world of today is than even twenty years ago, let alone forty. But look at that: practically every WC game was made in the space of one year, two at the most, so that the whole series was approaching its end point within eight years of WC1's release. Alongside the games, there was also a solid book series by that point, and the WC movie was in production. Well, the average video game today can take three years or so to complete. For a series to churn through so many big releases in eight years, today seems practically unthinkable. Not to mention Star Citizen, which, at this pace, looks likely to go from start to finish in the same timespan it took Origin to go from start of WC1 to the cancellation of Privateer Online and the death of the franchise. It's pretty remarkable, not because Star Citizen is some sort of vapourware, but because increasingly, this is going to be the pace we see in the industry. The level of detail, the amount of work required to complete a big-budget game (which WC1 certainly was at its time) today, is such, that if EA were to commence work on a new Wing Commander game now, we wouldn't see it until at least 2022.